Associate, Ogletree, Deakins, Nash, Smoak & Stewart, P.C. We have a situation where we are attempting to hire an old applicant that applied for a position back in January. The job posting is currently inactive and we were wondering what the best course of action would be moving forward. Should we disposition the candidate and have him apply to a more recent posting? I would not reactivate the old job posting and would disposition this individual as "not selected" for whatever the reason was for that particular opportunity. I'm not a fan of "sham" postings and they really are a waste of everyone's time, particularly those new/additional job seekers who apply thinking they actually have a shot at the opportunity. However, I know these things happen and it is perfectly legal to recruit/invite particular individuals to apply for any posted opportunity. "Best practice" in such cases would be to genuinely "consider" – i.e., evaluate the qualifications of those persons who express interest and possess the "basic qualifications" (as defined in OFCCP regulations) in addition to the individual you already have your eye on. You might be surprised! Or not. In any event, be prepared to defend your selection of this person based on his or her competitive qualifications with others who express interest. If you are going to post something new for purposes of selecting the January job seeker, I remind you to do the necessary outreach in the listing of the job, but I suggest that you leave the posting up for a very brief time (e.g. 3-5 days) to limit the number of job seekers for whom you might make any selection decisions. Not surprisingly, the OFCCP is extremely skeptical of "single applicant hires," but if this is a position for which you typically recruit/hire multiple times in a year, it's unlikely that this particular situation – which I trust is unusual – will be noticeable in aggregate data. Acting Director Craig Leen has signed a National Interest Exemption (NIE) related to OFCCP requirements for contractors involved with Hurricane Michael relief. The exemption and waiver include modified equal employment opportunity clauses in that employers would not need to create affirmative action programs (AAPs) if a contract is related to work for Hurricane Michael. However, contractors are still obligated to post the "Equal Opportunity is the Law" notice, keep and retain records for the three laws OFCCP enforces, and list openings with their proper employment service delivery system (ESDS). The exemption will be honored for any applicable contract entered through January 11, 2019. More information can be found on OFCCP's FAQ section. OFCCP, in partnership with the Office of Disability Employment Policy (ODEP) published a Notice in the Federal Register proposing to create the Excellence in Disability Inclusion Award, a contractor compliance award program that recognizes "federal contractor and subcontractor establishments that ensure equal employment opportunity, foster employment opportunities for individuals with disabilities, and have achieved a level of excellence in their compliance with Section 503 of the Rehabilitation Act of 1973, as amended (Section 503)." The public is encouraged to provide comments on the proposal by December 4, 2018. The list of requirements and instructions for organizations to be eligible for this award, as well as a nomination form to be submitted for consideration, are available on the Federal Register website. Deputy Director Craig Leen has signed a memorandum to exempt any projects or contracts from needing an AAP until December 31, if the efforts are related to helping victims of Hurricane Florence. While contractors will not need to develop an AAP until the end of 2018, they will still need to list their jobs with the appropriate Employment Service Delivery System (ESDS) as required under VEVRAA. In a recent announcement, OFCCP demonstrated its commitment to improving its relationship with contractors by entering into a Memorandum of Understanding (MOU) with the National Industry Liaison Group (NILG). The main purpose of the MOU is for the groups to focus on collaborative efforts to promote compliance and emphasize how individual contractors can successfully implement programs to improve affirmative action and equal employment opportunities. The MOU is also in place to help "improve the relevance, clarity, accuracy, and consistency of OFCCP’s contractor education and compliance tools and resources." 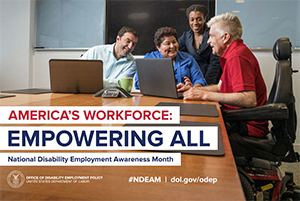 For more than 70 years, National Disability Employment Awareness Month (NDEAM) has been observed in the month of October. The theme for 2018 is "America's Workforce: Empowering All," as the focus is on acknowledging how crucial it is that all Americans have the opportunity to work for a living. NDEAM emphasizes the importance of valuing each person's skills and experience, including those of individuals with disabilities.